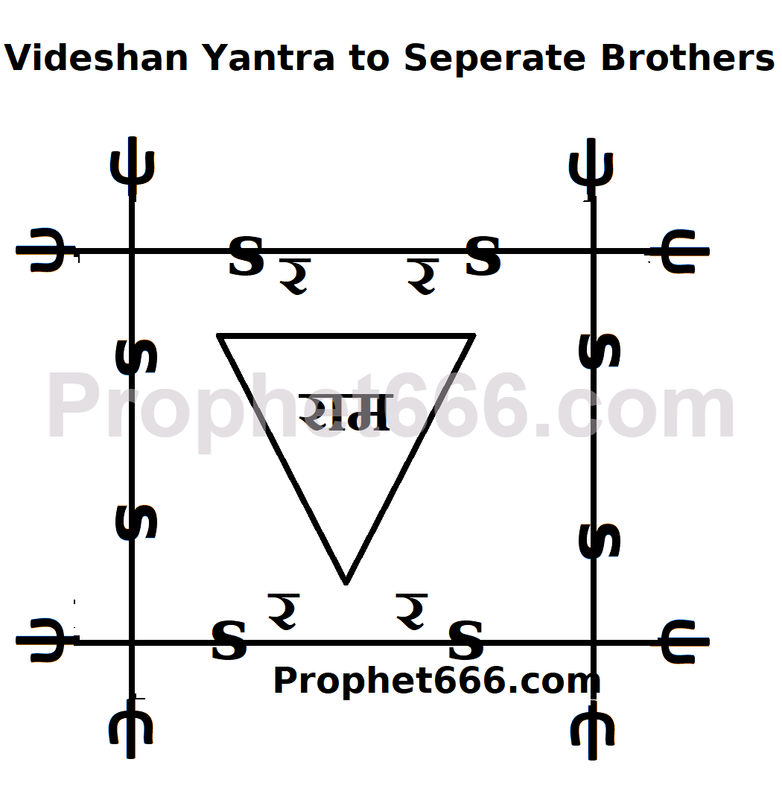 A most fearsome Videshan Yantra to separate 2 brothers from each other by creating a rift, disagreement or quarrel between them and dividing and making them sworn enemies of each other has been described by me in this post. In the Hindi language, this Videshan Yantra is called Bandhu Videshan Yantra. 1] The Videshan Yantra [shown by me in the diagram] should be drawn on a piece of cloth, which has been brought from a Smashan Bhoomi. 2] This Yantra Prayog should be done on the night of an Amavasya, by sitting in front of a burning funeral pyre and drawing the Videshan Yantra on the cloth using the pointed end of the feather of a crow as the pen and the blood of a sheep as the ink. 3] The Videshan Yantra, should then be worshiped and offered a Naivedya of rice that has been mixed in the blood of a goat. 4] It should then be offered Gandham and flowers and a Bali [sacrifice] of a small living thing like a hen, has to be performed. 5] Then, it should be buried in such a place where any one or both the brothers are likely to step on the spot of the buried Videshan Yantra. 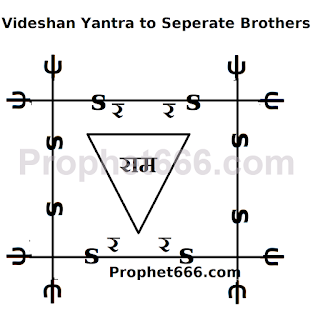 6] The Tantra says that when any one of the 2 brother steps on the spot of the buried Yantra, the power of the Videshan Yantra will be unsealed and this will create fights and disagreements between the brother and turn them into sworn enemies of each other. The depth of the hole for burying the Videshan Yantra should be 7 Angul deep, this works out to about 4 to 6 inches. If any other person, apart from the 2 brothers also steps on the same spot where the Videshan Yantra has been buried, then that person will also meet with misfortune. This is an out and out Tamas Guni and Aghori Yantra Prayog, which should be avoided at any cost, unless it is a matter of life and death for the practitioner. If used unwisely, the practitioner will also suffer from misfortune.